125 – Is Extraction of Wisdom Teeth A New Trending Topic On Social Media? Once orthodontic treatment is completed by orthodontists at Greater Houston Orthodontics a panoramic x-ray is taken to determine the exact position of your wisdom teeth to determine if extractions are required. 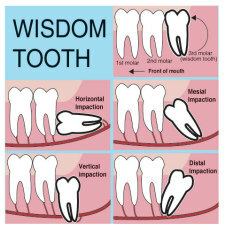 The roots start forming on wisdom teeth around age 16. If extractions are indicated, we recommend the teeth be removed sooner rather than later before the roots form by popping out the tooth bud for a much easier surgical procedure and recuperation time. For more information about third molar extractions and the best time to consider removal, contact our office or discuss with one of our team members at your next orthodontic appointment.